One week, Spelling is fantastic and Math scores are low. The next week, numeric equations get into a steady rhythm, and I wonder if my kids even speak the same English language that we are diagramming! There are days when I wonder if I am a good enough teacher for my children, and then intermixed with the studies and test scores is the most primary, personal, and significant subject called… LIFE. The tests come out of nowhere, like pop-quizzes for the soul, and these are the moments. I am married to a man who speaks up for the silent and defends the weak. He is gentle, yet not afraid of confrontation. Recently, he helped someone who was at her breaking point in the workplace. It was not an easy thing to do, and he ended up being “the bad guy” that the situation needed. You never really know what your kids are paying attention to, and then… a sudden LIFE moment! A few mornings ago, when the sun was just breaking through the clouds, Sadie walked briskly into our bedroom and out of nowhere announced with a direct and compassionate tone, “Daddy! The two guys who were bullying *Miss Kelly forgot to say ‘I’m sorry’ to you!” She walked right up to Mike’s side of the bed and said, “They should have said they were sorry to you too, Daddy.” Then she snuggled in between us as the sun finished rising. And yes, the sun rose high that day. Yesterday, Sadie was given the surprise of a lifetime, for a lifetime of four years, no doubt! 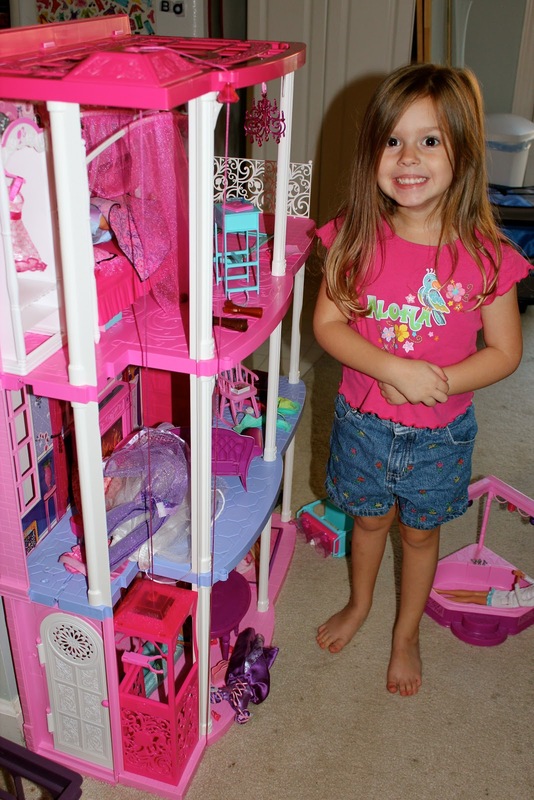 Her little friend Sophie showed up with her mom, two crates full of all-things-Barbie—dolls, the jeep, a horse, clothes, accessories, KEN… and… the Barbie townhouse!!! Sadie had no idea this was coming, and it was hilarious to watch her small frame become completely incapable of containing her joy. Sophie’s mom explained to me that Sophie (6) was tired of her friends coming over and wanting to play with the townhouse more than they wanted to play with her. So for a variety of reasons (primarily wanting to play with her friends face-to-face), Sophie believed that Sadie was to be the recipient of such blessing. Sophie has been saving her own money for a light saber, and when Jessica told that to me, J. Michael’s ears must have perked up. Unbeknownst to me, J. Michael gave Sophie his favorite blue light saber as they were leaving. That provided a blessing back to Sophie, the giver, that was completely unexpected, and about ten minutes after they left, my phone rang. It was Jessica. Jessica and I had a wonderful conversation about all of the dynamics that had just taken place, and on all levels, our kids had passed more of LIFE’S pop-quizzes… in red, in blue… AND even in…pink! Now, I don’t know what an ANT would do with a basketball… however there is a great reason why my kids are learning to live with the hearts of GIANTS. And that great reason is over six feet tall and loves to play basketball and play with his children. Mike went on to tell me that he and J. Michael have been going to a park in a section of town that we are not normally in. There is a group of teenagers who play pick-up games there. One of them is ALWAYS there, and other ones sometimes are and sometimes aren’t. Well the consistent one is the one with heart, and the one with heart is not always the one with skill, if you know what I’m sayin.’ The ballers left, and the boy continued to clumsily shoot around, so since Mike and J. Michael were finished with their drills, Mike approached this kid. “I was watching your shot…” He asked him a few questions, shared some observations, and just started to coach him. At the end of their time together, Mike asked him for his name. “My name’s Anthony, but you can call me Ant.” As Mike walked away, Ant went back to playing alone with his partially deflated youth-size ball. I woke up this morning with all of these stories colliding in my heart, so I had to blog them out! Yes, it is important to learn sentence structure, dates in American history, and the right answers to math equations. But in LIFE, there are times when 2+2 does NOT equal four—when kids want to play with your stuff more than you, when your own dad isn’t around to show you how to shoot a basketball, when you just wish you had more energy and physical control to play with your two-year-old granddaughter, and when you are about to quit your job because you just cannot take it anymore. In those moments, people who have passed LIFE’s pop-quizzes along the way will be able to walk alongside, and help with finding some solutions. These are the moments…that matter the most.